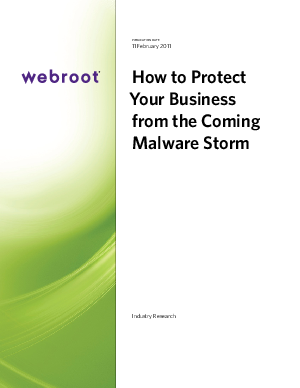 The malware storm will force the cost and complexity of premise-based protection to levels sustainable only by national governments and multinational corporations. To keep from being overwhelmed, small and midsize businesses must move defenses outside their own walls, to stop malicious code before it reaches their gateways, servers, and data stores. This paper describes the evolution and future of the online threat environment, and outlines the security, economy, performance, and control available to smaller businesses who act now to adopt Security as a Service.